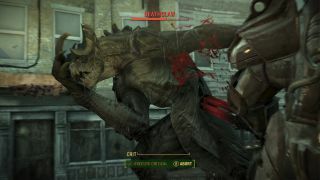 Last week, Bethesda released a Fallout 4 SPECIAL video explaining the merits of Strength: what it does for you, and why it's handy to have a little meat on your bones when you go wandering out into the wasteland. Now it's time for the next one in the series, that being Perception, the stat that makes it easier to put the bullets where you want them. As the video explains, high perception simplifies the task of pickpocketing, and more amusingly, reverse-pickpocketing—the ol' "stick a hot grenade in somebody's pants" trick. It's an amusing stunt, but not what I'd call the most efficient way to kill someone. Then again, I'm all about "building a long-distance relationship," as the video puts it, so maybe it's just a stylistic preference. In any event, perception also governs explosives handling and lockpicking—pretty much any task that requires a sharp eye and a steady hand, in other words. But the primary benefit is clearly to be found in VATS, the Vault-Tec Assisted Targeting System, where a high perception will give you better odds of targeting a particular body part in combat. And in those moments when another sunrise or a gurgling death hang in the balance, the difference between shooting somebody in the foot or in the face can be vital. With the S and the P out of the way, next week's video will almost certainly be E—Endurance, followed on a presumably-weekly basis by Charisma, Intelligence, Agility, and Luck. Isn't that SPECIAL?